A SQL Server Analysis Services (SSAS) cube contains billions of rows of data and is rapidly increasing in size. The cube consists of a single measure group and a single partition. The cube is currently processed by using the Process Full process option. - Partition the measure group by month. - Create a staging table that contains only data which is more recent than the last time the cube was processed. - Do not include data updates or deletions in the staging table. - Insert records from the staging table into the appropriate partition. You need to change the process option to meet the requirements. Which process option should you choose? To answer, select the appropriate option from the drop-down list in the dialog box. ProcessAdd applies only to dimensions and partitions. ProcessAdd is a new processing option for dimensions that did not exist in Analysis Services 2000. It essentially optimizes ProcessUpdate for the scenario where only new members are added. ProcessAdd never deletes or updates existing members. It only adds new members. The user can restrict the dimension table so that ProcessAdd reads only the new rows. 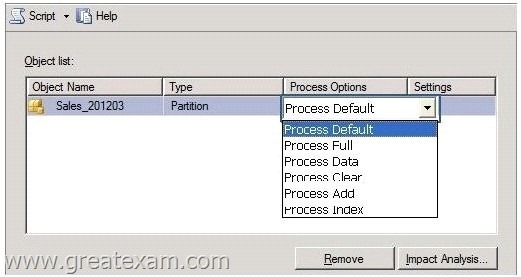 ProcessAdd for partitions is the equivalent of incremental partition processing in Analysis Services 2000. The user typically specifies an alternate fact table or a filter condition pointing to the new rows. 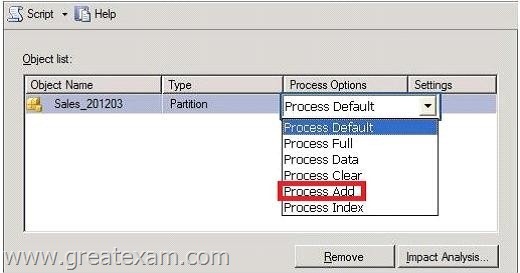 ProcessAdd internally creates a temporary partition, processes it with the specified fact data, and merges it into the target partition. You administer a SQL Server Analysis Services (SSAS) instance. You need to capture a continuous log of detailed event and subevent durations and custom trace events from queries executed in the SSAS instance. Box 1: Write an XMLA script to log the extended events of the trace. Box 2: Launch SQL Server Management Studio and connect to the instance. Box 3: Execute the script. - Auditing an instance of SQL Server or a SQL Server database involves tracking and logging events that occur on the system. 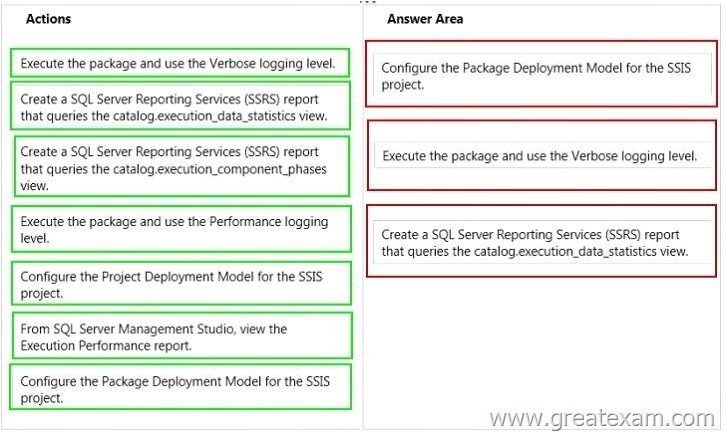 The SQL Server Audit object collects a single instance of server-or database-level actions and groups of actions to monitor. The audit is at the SQL Server instance level. You can have multiple audits per SQL Server instance. The Server Audit Specification object belongs to an audit. You can create one server audit specification per audit, because both are created at the SQL Server instance scope. - Trace events can be started and captured using SQL Server Profiler, , or can be started from an XMLA command as SQL Server Extended Events and later analyzed. - Extended Event tracing is enabled using a similar XMLA create object script. Displays the time spent by a data flow component in each execution phase. - The following example uses the catalog.execution_component_phases view to find the total amount of time that a specific package has spent executing in all phases (active_time), and the total elapsed time for the package (total_time). This view displays a row for each executable in the specified execution. An executable is a task or container that you add to the control flow of a package. Displays the instances of package execution in the Integration Services catalog. Packages that are executed with the Execute Package task run in the same instance of execution as the parent package. This view displays a row for each instance of execution in the catalog. Displays messages that are logged during operations in the Integration Services catalog. This view displays a row for each message that is logged during an operation in the catalog. The message can be generated by the server, by the package execution process, or by the execution engine. A dimension named Category is based on the DimCategory table. 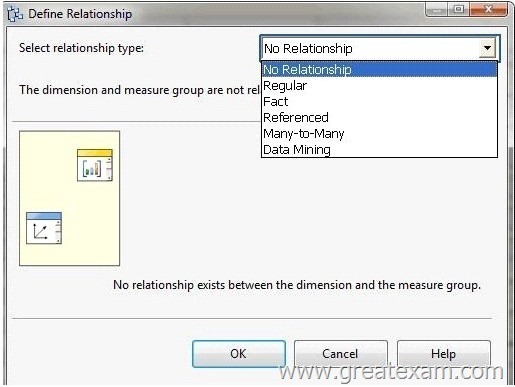 You need to relate the Category dimension to the Sales measure group. Link a dimension to a fact table indirectly through a dimension that is linked directly through a primary key-foreign key relationship. A SQL Server Analysis Services (SSAS) cube contains a large measure group. The fact table supporting the measure group is loaded with new data throughout the day. - Ensure that the cube displays current data as quickly as possible. - Maximize availability of the cube. - Maximize query performance for all aggregation levels. You need to choose a partitioning strategy that meets the requirements. proactive caching as a storage mode. storage mode. Process the partition each night. 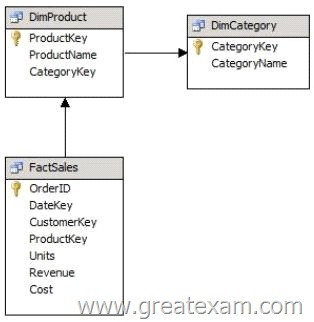 - Ensure that queries of the data model correctly display average student age by class. - Ensure that the solution supports role-based security and partitions. relationship. Create partitions in SQL Server Management Studio (SSMS). B. Create a multidimensional project and define measures and a reference relationship. Create partitions in SQL Server Data Tools (SSDT). C. Create a tabular project and define measures. D. Create a tabular project and define calculated columns. Create partitions in SQL Server Management Studio (SSMS). A report project must access multiple SQL Azure databases. Each database is on a different host. - The report must support subscriptions. - Users must be able to select the host when running the report. - To include data in a report, you must first create data connections, also known as data sources, and then create datasets. - A data connection includes the data source type, connection information, and the type of credentials to use. There are two types of data sources: embedded and shared. An embedded data source is defined in the report and used only by that report (fits this scenario). A shared data source is defined independently from a report and can be used by multiple reports. - Expression-based connection strings are evaluated at run time. 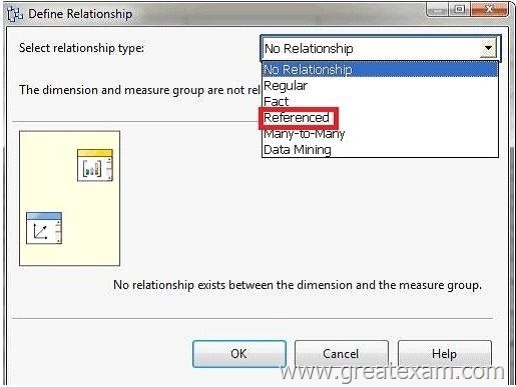 For example, you can specify the data source as a parameter, include the parameter reference in the connection string, and allow the user to choose a data source for the report. - Credentials You provide the credentials that are needed to access the data. The data source owner must have granted you the appropriate permissions to access both the data source and the specific data on the data source. An existing report aggregates data from a SQL Server database in a chart. - In Report Designer, after you create tables, charts, and other report items in a project, you can publish them as report parts to a report server or SharePoint site integrated with a report server so that you and others can reuse them in other reports. - By using Report Builder, you can customize and update reports that were created in SQL Server Data Tools (SSDT) Report Designer. - In Report Builder, IT pros and power users can create powerful operational reports, and reusable report parts and shared datasets. - (incorrect) Power View, a feature of SQL Server 2012 Reporting Services Add-in for Microsoft SharePoint Server 2010 Enterprise Edition, is an interactive data exploration, visualization, and presentation experience. It provides intuitive ad-hoc reporting for business users such as data analysts, business decision makers, and information workers. They can easily create and interact with views of data from data models based on PowerPivot workbooks published in a PowerPivot Gallery, or tabular models deployed to SQL Server 2012 Analysis Services (SSAS) instances. Power View is a browser-based Silverlight application launched from SharePoint Server 2010 that enables users to present and share insights with others in their organization through interactive presentations. You are designing a partitioning strategy for a large fact table in a Manufacturing data warehouse. Tens of millions of new inventory fact records are loaded into the data warehouse weekly, outside of business hours. Most queries against the database are generated by reports and by cube processing. A. Partition the inventory fact table by month, and compress each partition. B. Partition the inventory fact table by day, and compress each partition. C. Partition the inventory fact table by year. D. Partition the inventory fact table by week. You are modifying a SQL Server Reporting Services (SSRS) report for a SQL Server Analysis Services (SSAS) cube. The report defines a report parameter of data type Date/Time with which users can filter the report by a single date. The parameter value cannot be directly used to filter the Multidimensional Expressions (MDX) query for the dataset. You need to ensure that the report displays data filtered by the user-entered value. You must achieve this goal by using the least amount of development effort. expression that uses the same format as the date dimension member key value. so that it points to a name value for each date dimension member. function and accepts the report parameter value. D. Change the dataset query to Transact-SQL (T-SQL). Use the OPENROWSET function to query the cube. parameter value into the same format as the date dimension member. You administer a SQL Server Reporting Services (SSRS) instance in native mode. - Members of the role must be able to update shared data sources. - Members of the role must not be able to consume reports or manage subscriptions. - The role must provide only the minimum permissions required. - Standardized report formatting properties such as fonts and colors for report branding Formatting may change and new functions may be added as the reporting solution evolves. You need to create a strategy for deploying the formatting and code across the entire enterprise reporting solution. You must also ensure that reports can be easily updated to reflect formatting and function changes. A. Create a report as a template. Apply standardized formatting to the template. Store code in the Code section of the template. B. Build a web service that retrieves formatting properties and runs code. Call the web service through a report dataset. C. Store the formatting properties and code in database objects. parameter to a corresponding formatting property. D. Create an assembly that contains formatting properties and code. 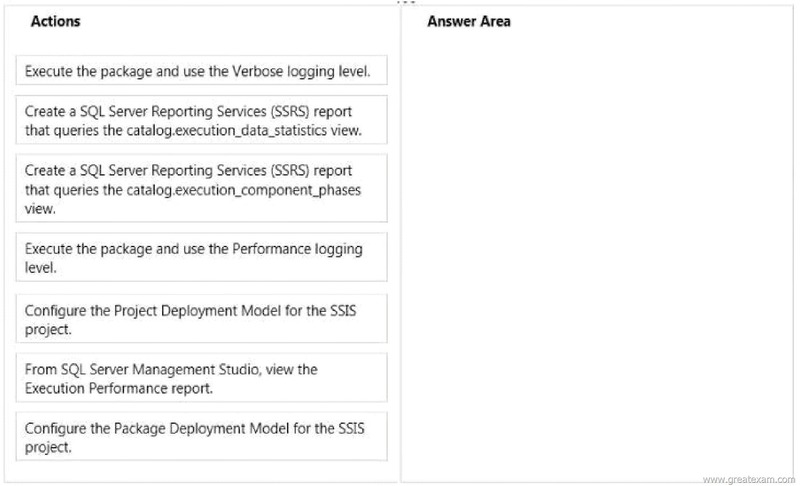 Deploy the assembly on the Reporting Server and reference the assembly from each report. You are designing a dataset for a SQL Server Reporting Services (SSRS) report. The report includes the report items displayed in the following graphic. The dataset is sourced from a commonly used stored procedure in an inventory data mart hosted in a SQL Azure database. It returns the status for all products across all storage sites. 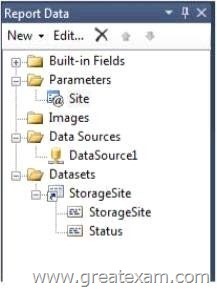 The report must display data for the storage site that is selected by the Site report parameter. You cannot change the stored procedure code. You need to filter the dataset to use only data specific to the selected site. Open a report in Design view. Right-click a dataset in the Report Data pane and then click Dataset Properties. The Dataset Properties dialog box opens. Click Filters. This displays the current list of filter equations. By default, the list is empty. Click Add. A new blank filter equation appears. In Expression, type or select the expression for the field to filter. To edit the expression, click the expression (fx) button. Box 1: Here we use the Fields expression. From the drop-down box, select the data type that matches the type of data in the expression you created in step 5. In the Operator box, select the operator that you want the filter to use to compare the values in the Expression box and theValue box. The operator you choose determines the number of values that are used from the next step. Box 2: we test for equality. In the Value box, type the expression or value against which you want the filter to evaluate the value in Expression. Box 3: we compare to the value of the Parameter named Site. 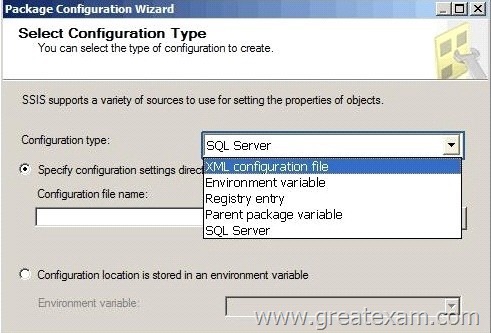 - Include multiple properties in a configuration. - Support several packages with different configuration settings. A variable in the package contains the configuration. This configuration type is typically used to update properties in child packages. - Ensure that the deployment model supports changing the content of connection strings by using parameters at execution time. - Ensure that the deployment model automatically starts from calls to the catalog.start_execution stored procedure in the SSISDB database. - Maximize performance at execution time. that corresponds to the SQL Server environment of each SSIS package. - The fact table must populate a column named TotalCost that computes the sum of the price and tax columns. - Before the sum is calculated, any records that have a price of zero must be discarded. - Adding one or more sources to extract data from files and databases, and add connection managers to connect to the sources. - Adding the transformations that meet the business requirements of the package. A data flow is not required to include transformations. Some transformations require a connection manager. For example, the Lookup transformation uses a connection manager to connect to the database that contains the lookup data. - Connecting data flow components by connecting the output of sources and transformations to the input of transformations and destinations. - Adding one or more destinations to load data into data stores such as files and databases, and adding connection managers to connect to the data sources. - Configuring error outputs on components to handle problems. At run time, row-level errors may occur when data flow components convert data, perform a lookup, or evaluate expressions. For example, a data column with a string value cannot be converted to an integer, or an expression tries to divide by zero. Both operations cause errors, and the rows that contain the errors can be processed separately using an error flow. - Include annotations to make the data flow self-documenting. - The capabilities of transformations vary broadly. Transformations can perform tasks such as updating, summarizing, cleaning, merging, and distributing data. You can modify values in columns, look up values in tables, clean data, and aggregate column values. - The Data Flow task encapsulates the data flow engine that moves data between sources and destinations, and lets the user transform, clean, and modify data as it is moved. Addition of a Data Flow task to a package control flow makes it possible for the package to extract, transform, and load data. A data flow consists of at least one data flow component, but it is typically a set of connected data flow components: sources that extract data; transformations that modify, route, or summarize data; and destinations that load data. - The package must maximize parallel processing of the T-SQL statements. - After all the T-SQL statements have completed, a Send Mail task must notify administrators. Box 1: Add a Sequence container to the control flow. Box 2: Add 12 Execute SQL tasks to the Sequence container and configure the tasks. Box 3: Add a Send mail task to the control flow. Add a precedence constraint for Completion to the to the Sequence container and link it to the Send Mail task. The Sequence container defines a control flow that is a subset of the package control flow. Sequence containers group the package into multiple separate control flows, each containing one or more tasks and containers that run within the overall package control flow. 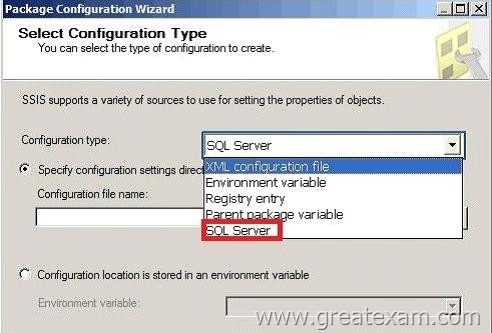 You are configuring the partition storage settings for a SQL Server Analysis Services (SSAS) cube. - Optimize the storage of source data and aggregations in the cube. - Drop cached data that is more than 30 minutes old. - Update the cache when data changes, with a silence interval of 10 seconds. You need to select the partition storage setting. Which setting should you select? To answer, select the appropriate setting in the answer area. Detail data and aggregations are stored in multidimensional format. The server listens for notifications of changes to the data and switches to real-time ROLAP while MOLAP objects are reprocessed in a cache. A silence interval of at least 10 seconds is required before updating the cache. There is an override interval of 10 minutes if the silence interval is not attained. Processing occurs automatically as data changes with a target latency of 30 minutes after the first change. This setting would typically be used for a data source with frequent updates when query performance is somewhat more important than always providing the most current data. This setting automatically processes MOLAP objects whenever required after the latency interval. Performance is slower while the MOLAP objects are being reprocessed. Get latest GreatExam 70-467 practice test and pass your exam easily. Passing the test is not so difficult now, you can easily pass the exam with our correct and accurate collection of GreatExam 70-467 question answers. 70-467 Braindumps, 70-467 Exam Dumps, 70-467 Exam Questions, 70-467 PDF Dumps, 70-467 Practice Test, 70-467 Study Guide, 70-467 VCE Dumps, Microsoft Exam 70-467 braindumps, 70-467 exam question, 70-467 pdf dumps, 70-467 practice test, 70-467 vce dumps. permalink.